Block 10 (12" x 12"). Reverse applique with appliqued spots of color. 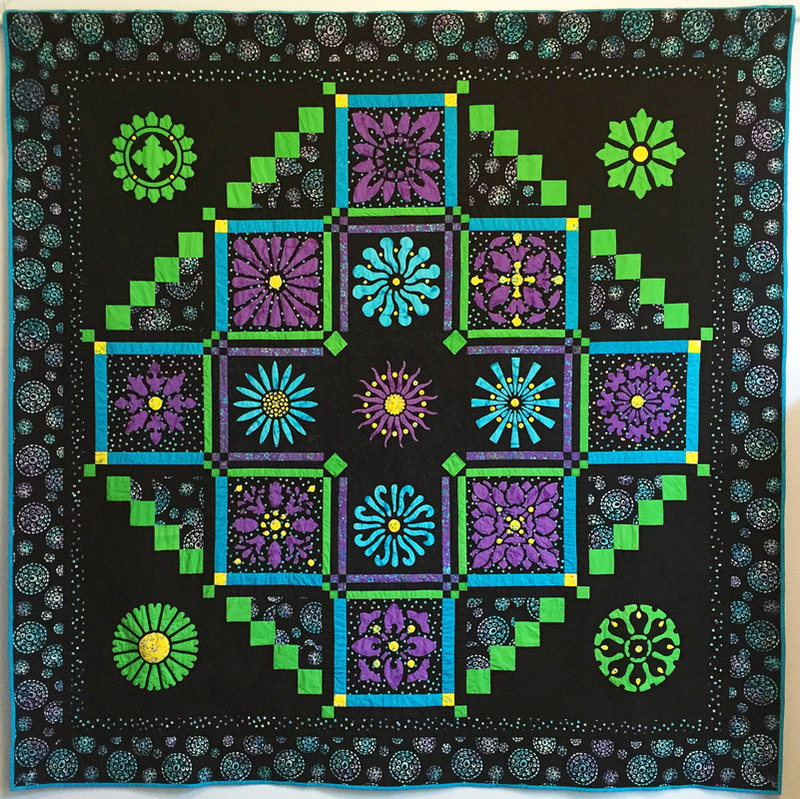 Be empowered and learn as you make one 12” block from the exciting Midnight Explosion Quilt VII (95” x 95”). Participants will make Block 10. It’s fun and easy to Hand reverse needle-turn with our Trace, Baste, Snip & Stitch process, and then applique some pops of color. Trace, baste, snip & stitch gives you great control over your piece, allowing you to have sharp points, crisp corners and graceful circles. You will love the results you get and you don’t get hung up on the pins. I will lead you step by step through the process, start to finish, empowering you to do reverse needle-turn appliqué by hand, do it like a pro and enjoy it! Required: Block 10 pattern, excerpted from Midnight Explosion Quilt VII - $14.00*. "Midnight Explosion Quilt VII* (95” x 95”) pattern by Eye of the Beholder Quilt Design, was designed in Black & Bright batik fabrics by Batik Textiles. Imagine making it in Blue & White, Red, White & Blue or Red & White. already traced out onto wrong side of fabric for background batik. *Special price for complete Midnight Explosion Quilt VII pattern for workshop participants. Special offer listed on supply list for worshop. Contact Vermont Quilt Festival to register! Information coming soon.